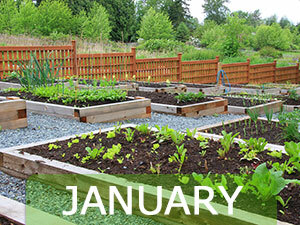 See the new year in with a fresh look on life and a resolution to give your garden a much needed, monthly TLC. Follow these tips for a rejuvenating January. – LEAF CONTROL: This is the perfect time of year to get rid of leaves with mildew or black spots on them. If the entire plant has had its day, it is strongly advised to remove this altogether as it could affect otherwise healthier plants around it. (See February for how you will replacement them). – SEASONAL PLANT ALERT: If you feel your garden looks dull and bare this time of year, there are many winter plants out there to spruce things up a bit. Try implementing Clematis (a winter-flowering evergreen) plant into your space.